Colour temperature: 2700K (Soft white) Light output: 750 lumens. Arctic Spray is a portable pipe freezing kit that allows you to work on plumbing systems without the need to drain down . JAG Plumbing Products strives to bring customers the best products in Canada and make them available on the best online shopping platform: Homedepot.ca - Owned and Operated in Ajax, Ontario, Canada, JAG PLUMBING prides itself on offering Home Depot Customers durable, high quality, non OEM replacement plumbing parts. This line voltage starter kit comes with 10' of flex track, power canopy and 4 support stems.Then choose from 3 flex track head options (sold separately). Item #'s 1000776176, 1000776173 & 1000776175 flex track heads.Bends into different shapes.Great for installation in kitchens, living rooms & basements. The Peak Lighting LED system provides smart lighting for your outdoors. Easily transform your backyard into a vibrant and colourful outdoor space by installing this LED system to your railing, fencing, posts, and more. It's perfect for adding light just where you need it, brightening up a living space and celebrating special occasions. This system is versatile, easy to use and comes in 3 components - the LED Starter Kit, the LED Extension Strip and the LED Strip Holders (each sold separately). Install this LED system and illuminate your home using the Wi-Fi enabled Peak Lighting app on your smart device. Endless colour options, music and special effects for this system are available with a few taps on the app to match any mood and style. Get started today and enjoy captivating LED lights in the comfort of your own home within hours! Philips Hue White Ambiance A19 Starter Kit. Light for your moments from sunrise to sunset. Enhance your everyday life. Philips Hue can wake you up and help you energize, read, concentrate and relax. Set the mood. Change the ambiance. Customize your daily routines into moments you can enjoy. Philips HUE Personal Wireless Lighting . More than your average light bulb. Its personal, clever, intuitive, and connected. Control your light environment from your smart device from wherever you are. Hue gives you the ability to change the colour, tone and brightness - creating your ideal lighting. Connect up to 50 HUE light bulbs to a single system, while using as much as 80% less energy than traditional bulbs. Simple and easy to use. Connects in three easy steps. Each Hue White Ambiance A19 starter kit includes: 4 Hue white ambiance light bulbs, one Hue bridge, power supply and LAN cable - allowing you to connect the Hue bridge to your router. Works with Apple HomeKit. 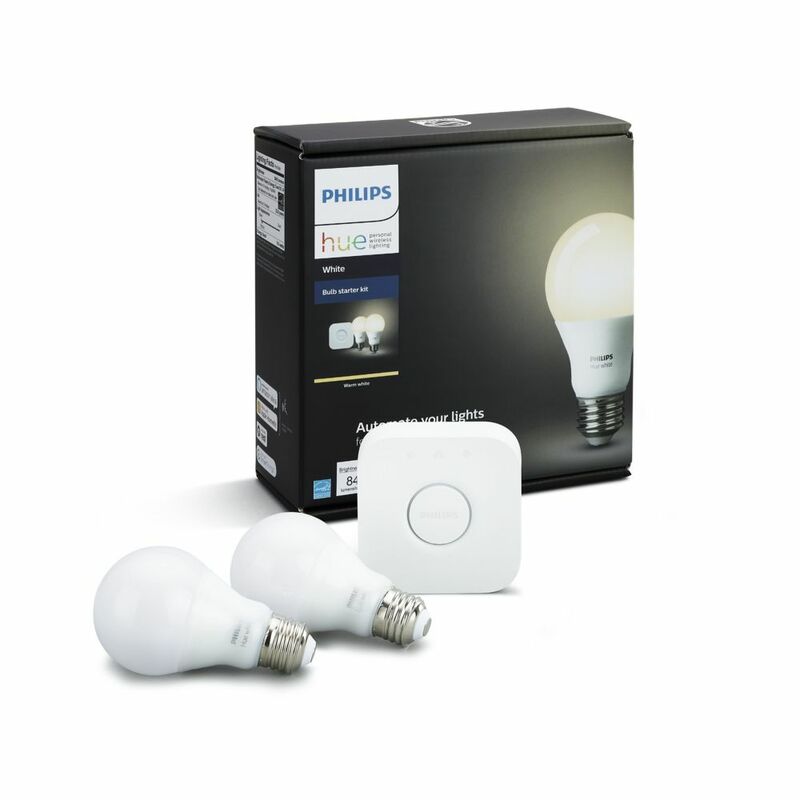 Hue White A19 Starter Kit - ENERGY STAR® is rated 3.0 out of 5 by 2. Rated 5 out of 5 by gdpclarke from Works Perfectly! I purchased this to upgrade my original Hue Bridge - only $10.00 more than the price of the bridge itself but includes two $15.00 bulbs. Easily transferred the settings from my old bridge and added the two new bulbs. The Apple Home Kit integration allowing me to use Siri to turn on or off the 11 bulbs I have simultaneously or by room or individually works like a charm. Rated 1 out of 5 by Cranky69 from Absolute garbage I just bought this and went to set it up. The App indicated that itself and and bridge was connected but when I tried to sign in it failed; telling me that the link to the bridge failed even though the App was showing that it indeed was connected. This is absolute garbage and I will be returning it tomorrow.